View of the chapel at Water Eaton Manor House in Oxfordshire. The church stands north of the 16th or 17th century stone gabled manor house at a remote spot by the River Cherwell. It was probably built at the same time at the manor house as its private chapel. It is quite simple: just a chancel and nave in the Gothic Perpendicular style. 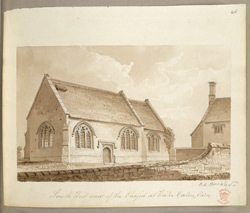 Although some public services were held here in the early 18th century for the hamlet population, by the mid 19th century it was still for practical purposes a private chapel. At the time of this drawing the manor house was used as a farmhouse.